I would like to claim that we are still in the post-palooza recovery, and that’s the reason we must remain parked in Lou & Larry’s driveway, but in reality I think that the recovery was complete last night. Now we are just hanging around because it is easy and fun to be here at the all-inclusive Northeastern Ohio Airstream Commune & Hotel California. Lou & Larry have rolled out the red carpet for us every year since 2006. As they say, you can check out any time you like, but you can never leave. Living here is like having an extended family, composed entirely of Airstreamers. There are three other Airstreams lounging here in the two driveways, and we all meet up daily for a group dinner inside the house. Last night Eleanor brought over peanut noodles, and a bowl full of honeydew melon & blueberries with mint/lime sauce (both dishes using recipes she demonstrated at Alumapalooza), Loren grilled sausages with onions & peppers, Shinim made delicious Korean appetizers and cellophane noodles with beef, sKY made an avocado & yogurt dip in her Vitamix blender, and Lou & Larry supplied all the condiments, bread, and cheese. Eclectic and fun. At 8:30 we headed over to Loren’s house across the street to try out the Wii game “Rock Band.” I’d never played it before. They have the full setup: two guitars, keyboard, microphone, and drum kit, so we could all play at once. I started on drums but was pathetic, so I switched to bass guitar. Mike and Loren were expert on keys, while slaDE and I struggled by on the guitars, but eventually we all got the hang of it and it was hilarious fun. Eleanor and Emma showed up later and joined in, singing and playing drums. My favorite time was when Eleanor and I did a duet of “Space Oddity” (David Bowie) while I played bass. They nicknamed me “Bouncy.” Whatever. It felt like the old days in high school, only it sounded a lot better. Loren says this has to be our official post-‘palooza decompression program from now. Today the plan was to drive up to Cleveland to visit the West Side Market, but unfortunately a repair intervened. It seems like something always needs tweaking when we come to Lou & Larry’s, which is actually fine because Larry always knows exactly where to go to buy a part or get something fixed. This time it was one of the propane tanks, which began hissing out gas when I turned it on. There’s a rubber gasket inside the valve that somehow got mangled and wasn’t able to seat correctly. We hauled it down to the local propane supplier to get the entire OPD valve replaced (replacement parts aren’t available) and it will be ready this afternoon. I suppose we could have still headed to Cleveland but I really need to get more work done. I spent the entire day Tuesday locked up in the Airstream, catching up on various things that were neglected over the past two weeks of traveling and ‘paloozing. The Fall 2012 issue needs a week of my attention and with travel plans I don’t really have a week of time available, so justifying another day away is difficult. We’ve also got to get on the Alumafandango tasks, which are innumerable and complex. Brett had a mishap yesterday on the road; the U-joint on the Argosy motorhome’s driveline broke, which caused the driveshaft to drop and flail around causing secondary damage. 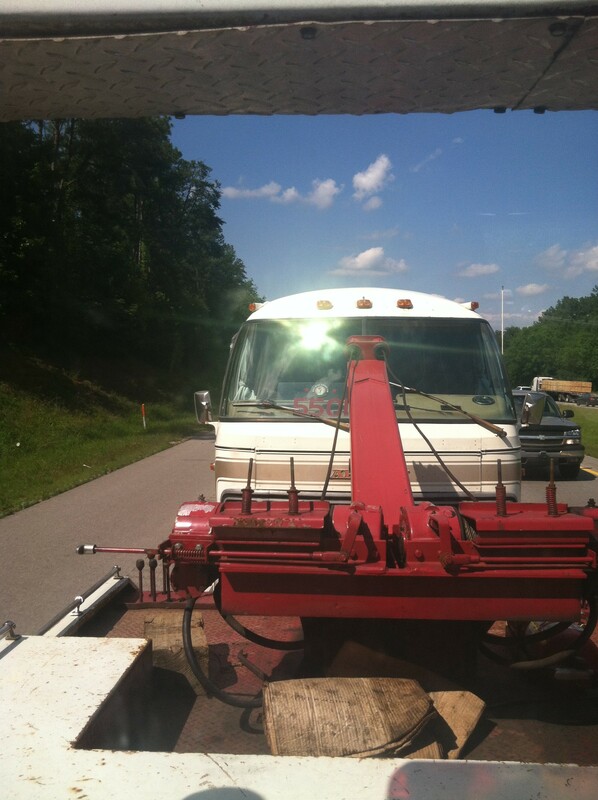 After a AAA tow, he and Lisa are now stuck in East Overshoe (somewhere in Tennessee) with a pair of mechanics named Cletus (both of them) whose primary tools seem to be hammers. Parts availability is poor, to say the least. Cletus and Cletus banged away at his motorhome until 1 a.m. last night and at this point he’s hoping that he can get a hack repair that will get them home so that the entire thing can be disassembled and fixed correctly later at twice the cost. I’m sympathetic, but on the other hand Brett’s conundrum is great for business. To distract himself from the saws, hammers, and blowtorches underneath his feet, he has been working on ‘fandango stuff. We’ve had a good call about the tasks ahead, and we are starting to come to grips with all the issues. So far we’ve covered the basics of volunteers, apparel, transportation, seminars, equipment rental, meals, contests, and entertainment, and we’ve confirmed Lodge Logic (cookware) will be coming in as a sponsor. If Brett is stuck in Tennessee for a few days we’ll get this thing nailed down in no time! That’s probably not going to be the case, however. We both have miles to go and much to do. He’ll get on the road today most likely, and we will be heading out shortly as well. Last night Eleanor and I worked out our routing for next few days, which is pretty straightforward (I-90 thru OH, PA, NY, then Adirondacks and on to VT). We are going to mix up the usual route with a few stops, including a long-anticipated taste of Forbidden Amish Donuts. We will depart on Thursday and plan to arrive in Vermont on Saturday, which for those of you who are curious, is back to our usual rate of 150-250 miles per day. We will try to avoid ending up in East Overshoe like Brett. Latest word on your sidkick is they are on the road after having to re repair the repair. We loved your visit, as usual. Good times to remember. We hope to do it again! Safe travels!